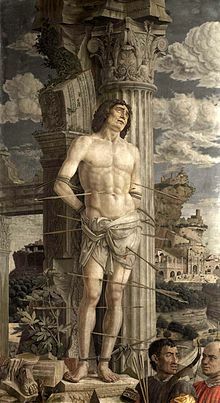 Andrea Mantegna (Italian: [anˈdrɛːa manˈteɲɲa]; c. 1431 – September 13, 1506) wis an Italian penter, a student o Roman aircheology, an son-in-law o Jacopo Bellini. Like ither airtists o the time, Mantegna experimentit wi perspective, e.g., bi lawerin the horizon in order tae create a sense o greater monumentality. His flinty, metallic laundscapes an somewhit stany figurs gie evidence o a fundamentally sculptural approach tae pentin. He an aa led a wirkshap that wis the leadin producer o prents in Venice afore 1500. This page wis last eeditit on 18 Mairch 2017, at 00:58.